Branche Silk Pillowcases will add a touch of elegance to any decor. Available in 11 elegant colors – white, ivory, blue, blush, silver, toffee, lavender, sage, coral, driftwood and black. 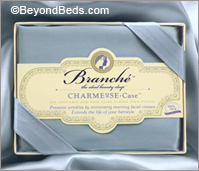 You will feel like royalty when sleeping on these Branche 100% Silk Charmeuse pillowcases. Silk contains 18 essential amino acids, so it is extremely gentle on your skin, and is hypo allergenic. A beauty benefit is that silk will not absorb your expensive night cream like cotton pillowcases sometimes do. The softness of silk against your face is heavenly and you won’t wake up with morning wrinkles. Silk is gentle on your hair, since silk does not cause friction of the hair follicles that comes from tossing and turning. Sleeping on these best in class silk pillowcases can prevent bedhead and tangles and helps with thinning hair as well. Branche 100% silk pillowcases are among the highest quality silk pillow cases on the market. Experience silk for yourself !